Chemicals capable of lightening the skin - variously known as skin-bleaching, skin-lightening, depigmenting, skin-evening and skin-brightening agents - are among the most commonly used skin preparations in the world. Globally, Africa reportedly exhibits a high prevalence of skin lightener use. In this review, we provide both clinical and social perspectives on skin lightener use in Africa, with particular emphasis on South Africa. We narratively explore the timeline associated with skin lightener use in South Africa and attempt to interweave the social rhetoric of this specific paradigm. Despite the risks associated with exposing the skin to known constituents of these formulations, such as hydroquinone and mercury, chronic use continues. In spite of legislation banning hydroquinone and mercury in cosmetics in South Africa, these ingredients are present in widely available products. We recommend better implementation of policies and greater ethical responsibility of multinational cosmetic companies in addition to the initiation of a system of random product testing and penalties that could improve industry compliance. • There is a high prevalence of skin lightener use in Africa. • Despite legislation banning harmful compounds, these compounds are still used in skin lightening formulations. • There is an urgent need to implement policies and recommendations for preventing the influx and illicit sale and use of untested skin lighteners. A diverse range of compounds is currently used in skin lightener preparations. However, the 'big four' - mercury-containing compounds (known as mercurials), hydroquinone and its derivatives (monobenzyl ether and monomethyl ether), potent corticosteroids and retinoids - are still considered the primary sources of damage. The biological consequence of each of these is considered below. Mercurials (mercury and its derivatives) are the oldest known skin lighteners.10 They act to lighten the skin by replacing the copper required for tyrosinase activity and antagonistically inhibiting melanin in melanocytes.11 Although banned by the US Food and Drug Administration in 1973 and by the European Union (EU) in 1976, mercurials continue to be produced and exported to countries in Africa and the Caribbean.1 Moreover, mercury poisoning through the use of skin lightener preparations continues to be reported from Africa12; Europe13,14; USA15,16; Australia17 and Hong Kong18. Hydroquinone, chemically known as 1,4 dihydroxybenzene, is an effective skin lightener which acts by preventing the synthesis of melanin through competing with its natural substrate, the enzyme tyrosinase, in a reversible reaction.19-22 In addition, it inhibits both DNA and RNA synthesis in epidermal melanocytes22 and becomes toxic to melanosomes11. Banned by South Africa in 1980, followed by the EU and Japan in 2001, hydroquinone continues to be available in the USA in dermatologically based preparations1 and its use for treating conditions such as melasma, pregnancy-induced hyperpigmentation, lentigines and other skin depigmentary disorders such as vitiligo23 continues to raise opposition by dermatologists. Chronic, unsupervised use of hydroquinone could result in a hyper-pigmented, skin-altering condition called exogenous ochronosis (Figure 1). Characterised by progressive asymptomatic hyperpig-mentation, the lower layers of the skin show signs of collagen and elastic fibre degeneration. Today, the vast majority of skin lightening agents include a form of retinoid. Topical retinoids include all trans-retinoic acid, 13-cis-retinoic acid (isotretinoin), retinol, retinaldehyde, tazarotene and adapalene.27 Well known for their anti-ageing effects28, retinoids function to lighten hyperpigmented skin by decreasing melanosome transfer from epidermal melanocytes, inhibiting both tyrosinase transcription and melanin synthesis29,30. With respect to management of skin lightener use, it is - undoubtedly - the current undivided global opinion of most clinicians and scientists that the inclusion of inorganic and other forms of compounds within cosmetic formulations should be strictly prohibited.18 However, difficulties ensue with compliance and relate to each country's policies and the enforcement thereof. This situation reinforces the pertinent need for a global standardisation of cosmetic policies and recommendations. 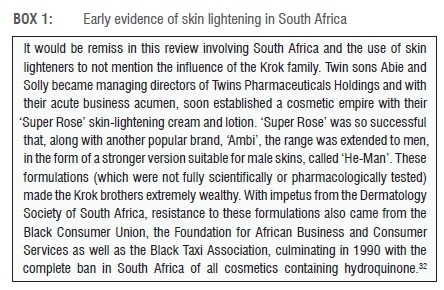 South Africa, in the context of its political overtones, has a distinctive history within the globalisation of skin lighteners.31 The period 19601970 saw a tremendous increase in the popularity of skin lightener use in South Africa with the market peaking in the 1970s.5 Whether this peak was because of aggressive marketing and intelligent advertisement strategies by emerging cosmetic companies or politically motivated cannot be quantified, but the broad appeal of these products continued to rely on the popular ideologies that linked lighter skin to power and beauty.32 An early dermatological study reported on a 6-year trial consisting of 840 volunteers who were drawn from various race groups with skins varying from very fair to very dark. The volunteers were subjected to open skin tests, 'normal usage' tests and standard 48-h closed-patch tests. In all, over 7000 skin test areas were examined. The results showed that concentrations of hydroquinone of 3% or less produced negligible adverse effects, irrespective of the base or the colour of the user's skin. This study stressed that any confusion of hydroquinone with the hazardous monobenzyl ether of hydroquinone (monobenzone) should be avoided.33 Another study34 conducted on 347 patients seen over a 6-month period at the Chris Hani Baragwanath Hospital in Johannesburg further reported on patients presenting with depigmented patches over their skins. The authors found that this effect was a result of the repeated use of an overnight 'depigmenting' cream containing hydroquinone at a concentration greater than 3%.34 By 1975, the South African government banned the inclusion of all forms of mercury in any skin formulations. Also in 1975, the South African skin lightener cosmetic industry was estimated at ZAR12.8 million per annum (about USD1.6 million at the current exchange rate). Despite warnings from renowned dermatologists, skin lightening creams continued to be illicitly sold and used for 'facial improvement and the elevation of social standing'33. It was claimed at the time that hydroquinone (at a 3% concentration) remained the only substance to reasonably depigment darker skin.33,34 Findlay et al.35 quoted patients as saying that if, on application, a product 'stings or burns the skin' that it is 'working well'. This perception of patients has led to the continued, unregulated use of even stronger formulations with consequential skin damage - a condition called exogenous ochronosis (Figure 1).35 By 1979, there was a growing concern regarding the high occurrence of ochronosis cases and a study by Dogliotti and Leibowitz36 showed that 6% of 5463 patients seen over a 2-year period presented with skin damage related to the use of marketed cosmetic preparations. These products included greasy paraffin derivatives, bleaching creams, lanoline mixtures and surface moisturising agents.36 Individual or multiple products were applied in the hope of 'clearing undesirable patchy hyperpigmentation, curing pimples and changing a dark complexion to one which was bright, lovely and seductive'36. This statement may have implied the perception that black skin was the antithesis of these descriptions, highlighting to young, impressionable black South Africans the 'need' for ongoing use. By 1980, the South African cosmetic market industry had swelled to an annual turnover of about ZAR25 million (~USD3.1 million), with the market described as 'phenomenal' and 'ripe for the picking'37. Findlay et al.35 further reported that evidence of ochronosis related to the chronic use of a skin lightener containing 8-15% hydroquinone. This cream was subsequently withdrawn from the market and replaced with the monobenzyl ether of hydroquinone known as monobenzone.38 These polyphenolics, traditionally used in the rubber and photographic trades39, work effectively as skin lighteners as they inhibit the enzyme (tyrosinase) primarily involved in producing melanin in the epidermis of human skin40. Unfortunately, chronic use leads to ochronosis35 (Figure 1). Owing in part to the Black Consciousness movement, laws emanating from the Us Federal Drug Administration and EU's Drug Administration RAPEX (Rapid Alert System for Non-Food Products ), as well as a significant change in the country's political profile, by 1990, South African products containing hydroquinone were completely banned.32 Moreover, South Africa became one of the first countries in the world to restrict cosmetic advertisements from claiming the ability to bleach, 'lighten' or 'whiten' skin.5 Despite this restriction, the skin lightener market did not experience the huge downturn expected. In contrast, there was an increase in use which could be explained by a massive rise in local, informal settlements and their own associated markets possibly further influenced by the opening of South African borders to neighbouring countries after 1994. Today, skin lightening cosmetics are widespread and new marketing campaigns describing the 'success' of those with fairer skin, have included products attractive to both young men and young women across Africa.31 However, not all people who use these products do so to lighten their complexion. 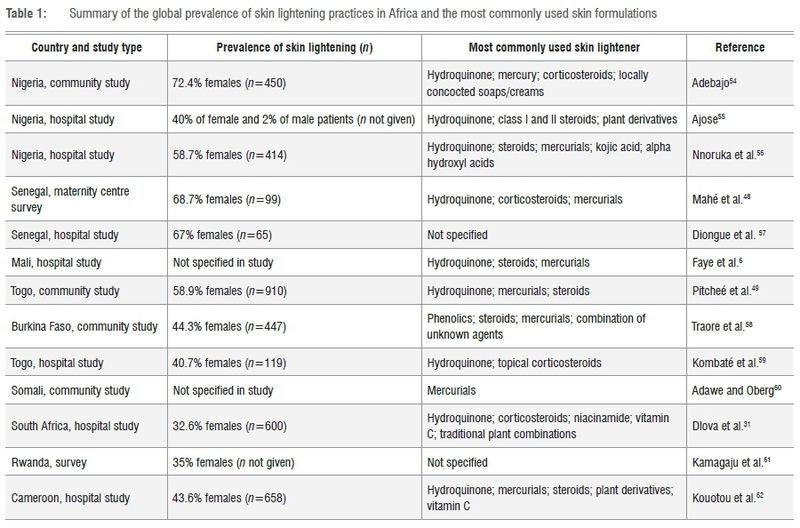 In a recent South African study of 600 women of African and Indian ancestry, it was reported that 32.7% used skin lightening products, but the main reason cited was treatment of skin problems (66.7%), with skin lightening accounting for only 33.3% of use.44 This point emphasises the need to inform populations that early and prompt treatment of conditions such as acne vulgaris reduces the risk of scarring. The use of illegal ingredients in skin lightener products continues to prevail throughout many African countries. A strong argument for safety exists to justify an interim ban (in all countries) on over-the-counter creams containing hydroquinone, pending long-term trials on the safety of these products. Moreover, the onus should be on manufacturers rather than consumers to establish such safety. Many countries in Africa and the African Diaspora, including Uganda, Kenya, South Africa and Gambia, have banned skin lightener products, while others - such as Ghana, Zambia, Jamaica and, most recently, Ivory Coast, have promoted public health education to dissuade people from using bleaching creams.9 Overall, Africa, and particularly South Africa, needs to continue research into the motivation for skin lightening. Given the inability of government bans to effectively prevent skin lightening, current studies should investigate other strategies aimed at improving industry compliance,8,49,52 such as random testing and penalties. We thank Mrs Theresa M. Wilson for her assistance, proofreading and general comments on this manuscript. L.M.D. and N.G.J. conceptualised the paper and researched the topic. All authors contributed towards the writing and editing of the manuscript.